One of the insidious things about still living here is that the changes creep up. A store here, one there, then you forget about Baar's, the toy store. Schrafft's, the book store at the corner of 84th and 37th. I could go on, but if you are old enough, no one else knows about these things except here. The Victory Gardens all over the neighborhood are one of my strongest memories. i've lived in new york since i was 17, and i turned 50 recently, so i've seen those changes. not so much here, though i have lived here since 1996, but everywhere. and i welcome those stories, love to patronize the old school places that are left, and fight tooth and nail against wholesale chipotle-ization. thanks for sharing these stories. they make me feel connected. Further up was Dairy Queen (across from the Post Office), Numbers records and tapes (probably the second Indian business) KFC, an old used book store, Guilietta pizzeria (which had the first Sicilian slices that I can remember) Fields Department store, and of course Jahns. On Roosevelt was the great Toy City toy store. This had sporting goods, hobbies, dolls, games, everything you could imagine! 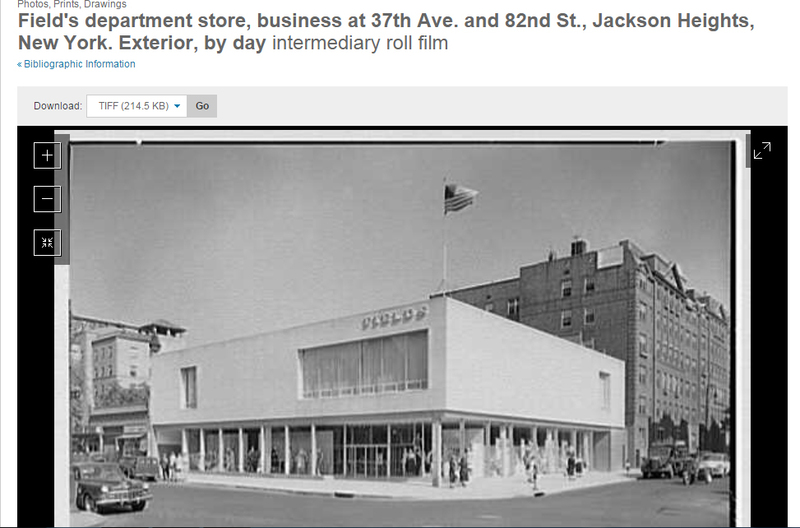 Thanks for this picture of Fields Department store. I remember the day I got my boy scout uniform there and became a proud member of the troop based at P.S.69. I never rose above 1st class scout level and can't recall any of the knots we had to learn but I do have very fond memories of the cobra patrol that I was part of. Just read your missive about Fields and buying your Boy Scout uniform there. The Cobra Patrol was led by a great scout named Ted Schroetter. Was wondering if he was there when you were. I spent time as the patrol leader of the Shooting Star patrol and then was the SPL (senior patrol leader) at Troop 217 in P.S. 69. I hear from Ted frequently and I'm sure he would be happy to hear about a former Cobra patrol member on the Jackson Heights Life. All the best to you. I can't remember at what age I joined the scouts-I guess I was around 11(1954?). The troop meetings were in the evening and involved all the patrols lining up to be addressed by the Scoutmaster who I think was called Mr. K. the K being short for a longer name that might have been something harder to pronounce.The ceremonial aspects of scouting have faded to some extent although the Scoutmaster's parting benediction to us all at the end of the evening for some reason and after all these years remains"May the Great Scoutmaster of all good scouts look after thee and me until we meet again. Troop attention!" I think that's a rough approximation. The bonus for all that was the end of evening game of Russian Bulldog-great fun that was too. Finally the walk home to 72nd street and the peeking in at the mysterious Blue Haven, Jackson Heights'only and now last night club. My patrol leader was by the way Brad Jayner -why I still remember his name after what feels like a millennial age ago is an open question and one that confounds me.It is in any event now part of my own treasury of Happy Days in the old Jackson heights. Great memory of Scoutmaster K's closing admonition. In 1953 a bunch of 217 scouts went to the Jamboree at the Irvine Scout Ranch in Irvine, California. Ted Schroetter, Burt Herman, Alfie Tisch, Rolf Barth, Jimmy Robinson and myself all went by train, no a/c, stopping along the way to visit D.C, St. Louis, Kansas City, Pike Peak, Albequerci, Nevada, and then the northern route home. Quite an experience meeting scouts from all over the world and swapping our kerchifs for theirs and bringing Texas horned toads home to JH. There were some fantastic night ceremonies with celebrity entertainers and 40,000 scouts joining in and being dazzled by the lighting and the moment. At 217 we were fortunate to have an excellent scoutmaster named Bob Howard for almost 3 years who was a doer, teacher, solid leader who everyone admired. A Boys Life editor, Bob Brooks, took over on a temporary basis when Mr. Howard moved to New Jersey. Brooks was a whirlwind of activity and camping trips. JH had 3 Boy Scout troops in 1950, P.S. 69, Community Church and St. Mark's. Chuckster--the toy store was around 83rd St., and was Gerstenhaber's. They had quite a selection of tin soldiers, among other things. A wonderful store. Tarbender--my brother knew Rolf Barth, and was in Bob Brook's Explorer post. I was too young and he moved on with Boy's Life to N.J. before I was an Explorer. The post went from about 80 scouts to three. Got a lot of tools at Sears and wool shirts at the Army/Navy store. joepartytime--we lived in the apartment below Dave Goldstein. Remember the empty store next door in which he kept his empty bottles? Never worked for him, but I did 'run drugs' for Meyer Banchefsky, Terrace Towers Pharmacy. He was a great influence on me, and I earned enough to buy a Heathkit tape recorder. There was a couple who lived in our 82nd Street apartment, I can only remember his name Kelvin Keech, who was a NBC radio announcer for the show Terry and the Pirates and several others. His wife was Russian and her brothers were Whites with the Russian Cavalry who battled against the Reds. Lots of young people interested in the theater and radio business used to say Mr. Keech was very helpful to them in their interest with advise and introductions. Right on the block with the Continental Restaurant, past the Singer Sewing Machine Store and Womrath Book Lending Store was a dry cleaning store, I believe Columbia Cleaners, with a lovely owner Mrs. Kramer who always wore the U.S. Army Aircorp pilot "Wings" that belonged to her son who was killed in action. This lovely lady was our local Mrs. Minever with a courageous attitude, always pleasant and upbeat. The padres from St. Joan of Arc rectory around the block were big fans of hers and pointed to one and all that she was a hero and we should all honor her. On the east side of Junction Blvd in the 1950s-- a few doors down from Buster Brown Shoes, a bank, and a luncheonette, there was a store whose main enterprise was cooked rotisserie chickens. Does anyone remember the name of this place? The proprietor's name was Bert. very interesting and straight forward story, buzz. regarding Escobar living here, I had not heard that before. He isn't listed as a resident on Wikipedia. I wonder if there is any way that could be confirmed. That would have been in the 1980s or 90s. de Dios Unanue was assasinated in 1992. I lived in Elmhurst, close to Roosevelt in the 60's. Does anyone remember Savin, the discount store on Roosevelt, bet 90-91 street, or the Golden Rice Restaurant which was next door? There was a fantastic pizzeria on 90 St and Roosevelt that was amazing! They also had rotisserie chicken. Does anyone remember the (Italian) bread bakery on 90 Street,?The Dragon Seed, the one near Junction had the best butterfly shrimp with bacon. All of these places are long gone. It was a great place to grow up!